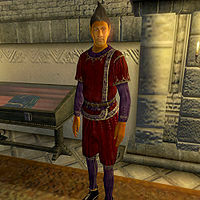 Dupineon is an Altmer mage who lives with the Stirks in their family manor. More specifically, he shares a bed with Sevillus Stirk. During the Painters In Love quest, you will be directed to him for another idea to save the Amatiuses' marriage. Living free of rent with the island's richest family means Dupineon can take life on the easy side. After waking up late at 10am, he immediately heads outside and will be found wandering between Stirk's residential district and the chapel for the rest day, taking a two-hour break at 6pm to eat dinner in the first floor dining room. At 2am he heads back inside and curls up next to Sevillus in the westernmost bedroom of the manor. The only time he will break off from his usual routine is during the Father in Trouble quest, when he will join most of Stirk's townsfolk in front of the burning chapel. Another benefit of Dupineon's position is that he can afford the very best clothing the mainland has to offer: a red velvet blouse, matching pants and a pair of gold trimmed shoes. He also carries the manor key on his person. While he is unarmed, he sure isn't defenseless. Like a true Altmer wizard, he can cast an astonishingly varied number of spells: journeyman chameleon and cure disease spells, dire enervation, shocking burst, lightning bolt, lightning surge, scorching blow and ice bolt. He also possesses the Altmer racial abilities: 100 points fortify Magicka, 75% resist disease and 25% weakness to fire, frost and shock. While he doesn't have any official job, he keeps himself busy by caring about the various relationships on the isle. When first met, he will tell you: "Poor Hannia Kynarius, I have no idea how she deals with her husband's alcohol addiction. That man needs help or their marriage will surely fall apart." This will add the I Drink Alone quest to your journal. After this, he will greet by saying: "I'm Dupineon, I live with the Stirks. I don't care about what anyone says about Altmer, I am no traitor to the Empire." If you ask him about the Amatiuses he will suggest an item to get for Selvia: "You've heard about their love problems? Poor darlings, it's been especially hard on Selvia. Jonuni's just got his head in the clouds, no idea how she feels. Their love was so romantic once. Selvia told me the most enchanting story about how he won her over. He gave her a nightshade blossom. A nightshade blossom, by Dibella. Oh! I just had the most miraculous idea. You could get him a nightshade blossom, and he could give it to her to make things better! What do you say?" If you have already talked to Alenion Eulius or Castameloria Stirk instead, he will be delighted: "By Dibella, that's a splendid idea. She told me a romantic story once. Jonuni first won her heart with a nightshade blossom. You could get him one of those. Keep working on it, darling, this is brilliant." When asked about Stirk, he will tell you one of many generic replies, although he tends to talk about the history of the island: "Did you know that Stirk was integral to the Empire during the Tiber war? It helped defend Colovia against the Aldmeri Dominion" or "Armondian Stirk oversaw the island during the war, but his son Tiber made the island thrive by selling land to buy homes." You will probably learn about his homosexual tendencies for the first time when talking to Helga Open-Legs: "I don't think he's interested in women, to be honest". Julia Basilla will offer another clue when telling you about how he reported Helga to the guards: "A few days ago a girl washed ashore. Called herself Helga and wouldn't say where she was from. I heard she tried to peddle herself onto that Altmer, Dupineon. She'd be in the prison if you wanted to talk to her." Painters In Love: Rescue the relationship of a young and artistic couple! I Drink Alone: An elderly noble likes his wine a little too much. Take pity or profit? You might also hear a rumor around town about a lost property: "I heard that Dupineon and Sevillus Stirk lost something over at the docks not long ago. I wonder what it was." In the Complaints book, the 'something' is specified as a chest. Indeed, if you look underneath the docks you will find a 'Lost Chest' containing 100 gold. This page was last modified on 16 November 2018, at 05:22.